James Rougvie was born in 1949 to James and Anne Rougvie. He grew up in Thornton with a gift for mischief and attended Kirkcaldy High School with brothers Alex and Scott. He began his career in journalism with DC Thomson as a reporter with the Courier in its Dunfermline office then moved to Kirkcaldy. He married in 1973 to Elizabeth Morley-Hill, with whom he had two children, Charlotte and Nick. A talented athlete and footballer in his youth, Jim played for Thornton Hibs and Cupar Hearts and had weighed the option of a professional football career having had trials as a teenager with Aberdeen FC. The football world’s loss was journalism’s gain, however, and many a young reporter can tell of being steered by his hand as they started their own careers. He moved to the Cupar office of the Courier in 1977 then to Dundee in 1979 before moving away from DC Thomson in the early eighties to take up the role of district reporter for The Scotsman where he spent 20 years covering Tayside, Fife and further afield. In his career with The Scotsman he covered, amongst others, the Piper Alpha tragedy and subsequent inquiry, the Timex dispute and was in Dunblane following the tragic events at the primary school in 1996. A flair for writing, and known for his knack for sniffing out a story, Jim was recognised as having a rare aptitude for news reporting. He possessed legendary shorthand and would spin a yarn of having made Pitman’s famously quick methods even quicker notching up 200 words per minute. A rare speed. His work from the office near Dundee’s Wellgate Centre could be prodigious; his office every inch the classic newsroom of scattered papers, a clattering fax and dusty piles of back issues. When the mood took him, he would attack his new computer as if trying to batter an old typewriter into submission. He forged a close friendship with the cadre of district reporters whom he respected enormously for their work and their support. On leaving The Scotsman it was the district team who attended a few drinks in the Golf Hotel in Crail to talk over old times and moving on. Jim was aware that a Sheriff, whom he knew from both sides of the court room, was likely to be home at Crail watching the world go by from his large bay window. This was the mark of the man, that even having been sentenced by the same Sheriff for a driving offence, he bore no ill will and no grudge and wouldn’t shirk an uncomfortable encounter. He was an “old school” reporter, preferring to work through the shoe leather on a story than wait for it to come to him. This was put to the test in his retirement when he was challenged by BBC Scotland for a documentary on the changing media. His task was to compete for stories with a young journalism graduate who would use social media and the internet against Jim’s well-worn methods of knocking doors and speaking to locals. In a matter of hours he’d tracked down and written up a handful of genuine exclusives that would grace any paper. He would recall with a twinkle in his eye that he’d missed the “big” story of a coffee morning at Waid Academy which had been on the school’s website. He moved to Wormit, Fife in 1991 and married Eileen Hunter in 1993, whom he had met on a blind date. 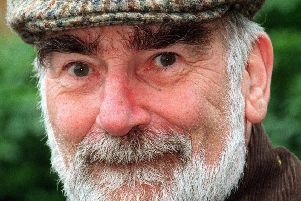 His career took him from The Scotsman to the world of freelance journalism with the Dundee Press Agency before returning to the Courier until his retirement from journalism. He was left heartbroken by the death of Eileen from cancer in 2005. In retirement he was a regular on the golf courses at St Andrews and took delight, and no small measure of pride, in inviting many tourists to join the locals for a game and guide them through their round on the windswept links. Always a keen lover of nature, he spent the last few years volunteering with Scottish Natural Heritage at Tentsmuir Forest, near Tayport. Jim died at home in Wormit after a spell of ill-health. His ashes will be scattered in Fife.